My first ever camping experience, back in the summer of 2013, was at the incredibly beautiful Chandratal Lake in Spiti Valley, a cold desert valley that is the middle land between India and Tibet. A sweet water glacial lake in the Himalayas and the source of the Chandra River, the Chandratal Lake is a RAMSAR Convention designated wetland of international importance. It is also believed that the elusive Snow Leopard calls the catchment area of this lake its home. Though I wasn’t fortunate enough to catch a glimpse. Chandratal Lake is in Spiti Valley, Himachal Pradesh. A valley – in the hinterland of the Indian Himalayas – bordered by Ladakh to its North and Tibet to its East. Why should you visit Chandratal Lake? To pitch a tent amidst the magnificent Himalayas on a freezing summer night and to sleep under the starlit sky is amazing enough in itself. But if the campsite was to be at this remote and not-so-easily accessible Moon Lake, there then you have the trip of a lifetime guaranteed! How to reach Chandratal Lake? This is the most popular and also the most convenient way to get to Chandratal. We left from Manali early morning & it was by evening that we reached Chandratal. After a slight delay at a roadblock on the Rohtang Pass due to a landslide, we made quick stops for breakfast & lunch at Gramphu and Batal. Then the mandatory stop at the Temple on Kunzum Pass & we were at Chandratal, just in time for the setting sun. The Chandratal Lake in all its glory. First glimpse of Chandratal, as you reach the end of your hike from the campsite. The walk that leads up to it..
& here you are at the lake. 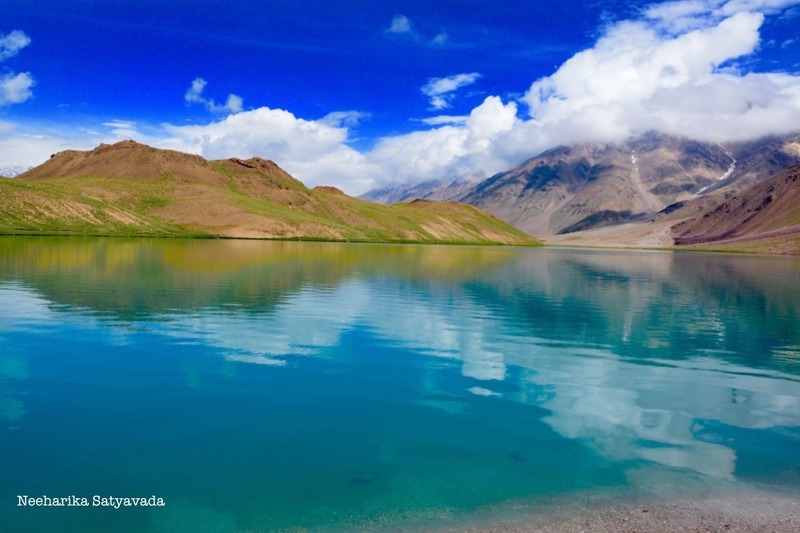 The Chandratal Lake reflects the colour of the sky. This image was shot at sunrise, just when the lake starts to appear – a clear blue mirror of reflections. & as the sun sets, it turns green. From the minute you get to the lake, an all-consuming sense of peace washes over you. Adding to the serenity of the lake are the Buddhist prayer flags fluttering in the breeze. My life changed when I lay eyes for the first time ever on the mighty Himalayas. Their sheer magnificence is humbling. So, it is but natural that the experience of spending time at this pristine lake, nestled in the snow kissed mountains, totally transports you to another time and place. Love the imagery! These are some stunning pictures! Thank you so much!! These pictures help me relive those memories 🙂 so glad you enjoyed them too..
Beautiful……touches the soul!! Thank u! !